On the 21st of April 1988, Amma consecrated the first Brahmasthanam (abode of the Absolute) temple at Kodungallur, which was constructed according to Her instructions. Amma’s Brahmasthanam temples are so different from the common temples of India today, it can be said that they are the hallmarks of a new epoch in temple worship. While many temples have shrines to more than one deity, each deity is represented by a separate murthi (idol). Amma’s temples have only one murthi. But in a revolutionary move, She instructed that the stone murthi be carved with four faces, one on each side. The shrine depicts the images of Shiva’s Divine family: Shiva, Devi, Ganesha and a Serpent (representing the Kundalini power, Rahu and Murugan). This clearly points to the underlying unity inherent in the myriad deities of the Hindu pantheon: the One with many faces. The temples are kept in pristine purity through daily pujas that regenerate the atmosphere of pure devotion, and kindle a sense of unity among the devotees. Everyone, irrespective of gender, caste or religion is welcome to worship. The serenity of the temple atmosphere is maintained throughout the year by allowing only activities with direct spiritual bearing to be held in the temple premises. At a typical temple festival in today’s India, there are no satsangs, no spiritual words of wisdom, no bhajans. If there is a puja at all, it will be in a corner of the temple and ignored by most in favour of the dramas and other entertainment, which are no different from what one might see at a cinema. Generally the temple authorities allow this to go on because it seems to be the only way to draw people to the temple at all. But Amma has “driven the money changers out of the temple.” Or rather, in Her infinitely gentle fashion, She built Her own temples and never invited them in. At Her three- and four-day festivals, the Sri Lalita Sahasranama is chanted five times daily in a call-and-response fashion to allow everyone to participate. Amma Herself sings bhajans twice daily, and the swamis and others sing continuously as long as She is giving darshan, which She does for the better part of the day and night. Sannyasis, brahmacharis, and spiritually-minded devotees give satsang both in the morning and the evening. At Amma’s Brahmasthanam festivals, scarcely a moment passes when the Names of God are not being chanted—broadcast on dozens of speakers up to a kilometre away so that all in the darshan queue can hear—and each attendee has the opportunity to see, hear, touch, and share their sorrows with the Goddess. Traditionally, if you wanted the benefits of a particular puja, you had to pay a priest to perform the puja for you. But Amma reasoned that if you are the person who is suffering, you must perform the puja yourself. “If you are hungry,” She said, “It’s not enough that someone else eats.” After so many years of listening to people’s problems, Amma determined that, generally, people experience sorrow or difficulties when their lives are under the influence of Saturn, Mars, or Rahu. 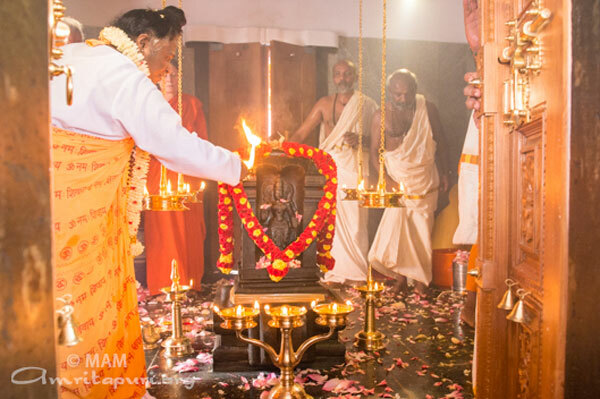 In another revolutionary move, Amma initiated mass pujas, guided by herself or one of her monastic disciples, in which each participant performs the puja for him- or herself. Amma asked everyone to join in these pujas, without any distinction of caste, religion, age or gender. Amma wanted to removed the oft-misused authority of the priesthood, letting the people connect with God directly. Thousands of devotees converge to witness the dedication of the new Brahmasthanam temple. As dawn breaks, Amma walks up a ramp to the temple’s peak, where a temporary platform has been erected. She is accompanied by a small group of pujaris and sannyasis who will assist Her during the Kalasha Stapana. The Stapana begins with Amma turning full circle. Greeting the throngs of devotees below, She is engaging their prayers and hearts in the ritual She is about to perform. Then She sits for some time, still and silent in meditation, while the air reverberates with the sound of drums, temple horns and bells. 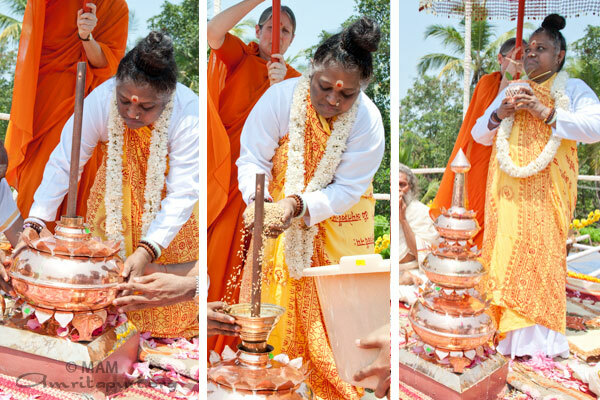 When She stands, Amma first holds the largest of three brass containers, raises it to Her forehead, and again turns a full circle, as if offering it to all the people. Then She sets it in place on the central post as the base of the stupika. With both hands She pours living grains into the brass container, until the container is full to overflowing. 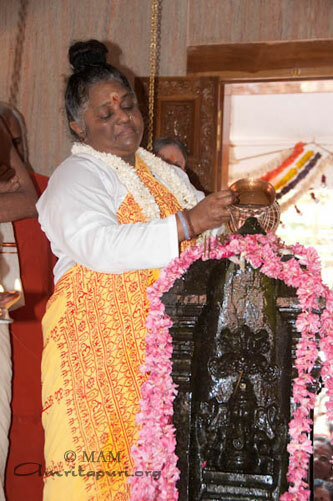 When the grains begin to rain down onto the platform, Amma places a slim divider and then the next container – smaller in circumference, but a brass bowl similar to the first. This too, She fills with grainsand overfills. One more bowl is filled and the edifice is nearly complete. There is a pointed tip yet to be put in place. In the morning, to the sound of bells and a conch, Mother walks into the heart of the new Brahmasthanam temple. In there, we can see a rather empty placea small square room containing only a black square hollow at its centre. The murthi (idol) is still outside. Mother designed this unique murthi for Her temples. It is a graphic representation of one of Her primary teachings: that God may have many different faces, but underneath is truly only One. Unity in diversity. The one piece of carved black stone shows on its four different sides Devi, the Divine Mother; the elephant-faced Ganesh, remover of obstacles; Lord Siva, and a serpent for Rahu. The room inside the temple loses its vacuous feeling when Amma steps inside. She greets the people gathered outside seeming to say, “Come, be here with me.” She then takes Her seat on the floor, facing the hollow base. In Her hands She holds a glittering gold leaf on which is drawn the Sri Yantra. She gazes upon it for some time, then gently rolls it up, anoints it, and holds it to Her forehead before depositing it in the hollow of the base. One by one She places pink lotuses on the four corners of the square base, and also midway along the sides. The last lotus, fully opened, She clasps to Her Heart, and for a long time, motionless, She meditates. Then, as the Panchavadyam musicians play ever more fervently and a blown conch rends the air, a group of brahmacharis emerges into the courtyard. They are bearing the new stone murthi. They circle the temple to enter the front (east) door, the same one through which Amma passed before them. Labouring, backs bent, arms stretching down with the immense weight, they carry the image up the steps and into the inner sanctum, where they lay it on a small bench near the hollow base. They leave, the doors close, and the waiting begins. “Om Siva Shaktyaikya Rupinyai Namaha” the crowd chants on and on, the musicians play on, the bells ring continuously. Suddenly the temple doors open and there stands Amma She comes to each door, again engaging the devotees in what She is about to do. The doors close. The chanting continues, and the bells and the conches and the musicthis time for much longer. What is going on inside, the people can see only in their hearts, but most know that at this stage Amma is engaged in the almost indescribably holy: She is transferring Her vital force, Her divine energy, to this piece of carved rock, subtly changing it from a mere stone to a true murthi, a representation and real presence of the Divine. A temple thus installed by a mahatma will retain this blessed state forever, becoming a truly holy place for all who come seeking God. At last, the temple doors open, and this time one does not see emptiness: there, on its base, stands the black murthi, draped in white garlands. 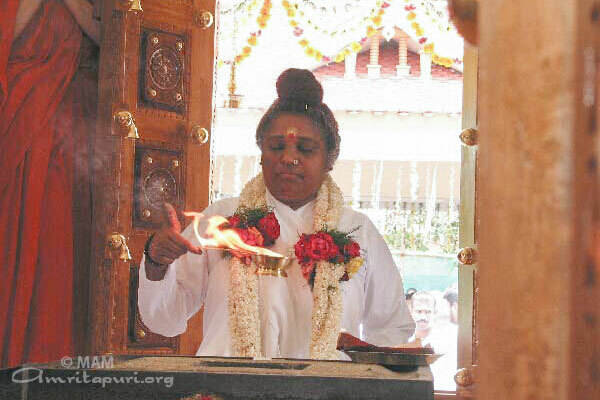 Amma waves an arati lamp, circling the murthi. Her arati finished, She performs abhishekha. Pot after pot of sanctified waters She raises above Her Head; holding each there, still, with eyes closed, She meditates; and then gracefully lowers each over the waist-high murthi. Upturning each, She lets the water splash over the murthi and down to the floor, whence it flows into the mouth of a spout. Outside eager devotees reach out cupped hands beneath the spout. When this ritual bathing of the image is finished, four sannyasis, now standing in the inner sanctum with Amma, perform arati simultaneously, one to each side of the murthi. By the way they wave the flames and the way they offer petals at the foot of the image and at Amma’s feet, they show their reverence for Amma as one who not only breathes life into this piece of stone but whose very life itself is the presence of God. The arati is finished, and Amma once more meditates, standing somewhat back away from the murthi, almost in the corner, as if to say: “Now focus your attention on the murthi and what it is meant to remind you of; My energy is there.” To once more acknowledge, engage and bless Her thousands of children who are gathered outside the temple, Amma proceeds again to each of the four doors, this time showering flower petals out towards the devotees. This offering of petals is done to God, and images of God; when Amma does it in this way, She is recognising the Divinity in all beings. Amma then leaves the temple. On the 21st of April 1988, Amma installed the first stone image in the first Brahmasthanam temple at Kodungallur, constructed according to Her instructions. By now 22 such temples had been installed by Amma.